As a former volleyball, basketball, soccer, and softball athlete (notice, all multi-player, ball team sports) I recently experienced a little bit of a “denial” phase that I can now consider myself a rower. In college, the rowers were always nice people–perhaps a little odd to me. I mean being involved in the sport has to attract a certain kind of person…and mental capacity. The rowers I knew in college woke up at crazy times in the morning to go workout in the freezing cold ON WATER of all places, only to come back in the afternoon and do it all over again (I have found quickly that this is still the case in my post-college experience with rowers). I have learned to love 5:30am. My training partner said the other day: Rowing builds character, but it can build two kinds of character. It can build the good kind of character in that it truly forces you to dig deep and find the best that is inside you. To be successful at the sport you have to be committed, you have to have discipline, and you have to have passion and truly want to row. There is very little fame and money in being a successful rower (if there is, please enlighten me!). You do it because you love it. Which actually segues to the other kind of character rowing builds. The crazy kind. It seems there exists a fine line between the two, but rowing can lend to building “the crazy” character as well. Some of my close friends may disagree but I plan to stay on the sane side of things. Borderline, but sane. You’re defined by one of two sides. “Oh hi, what are you?” I’m a port. I’m a starboard. And the little ones running around–I’m a coxswain…”a cox–what? Why are you so tiny? Are you the midnight snack for all these other beasts?” Take one look above and tell me that thought doesn’t cross your mind. Ohh and the spandex. Don’t get me wrong, I played volleyball for much of my young and college athletic career so I know what it is to live in spandex. We lived and died by our spandex–it’s the only reason we had fans in the stands half the time. But the unis or “onesies” as I affectionately call them are just special. But what is it with the crazy designs and colors? It’s the 80s meets the water….I don’t hate it. Can’t help but love it. Where else can you get away with wearing something like this and still be a badass? 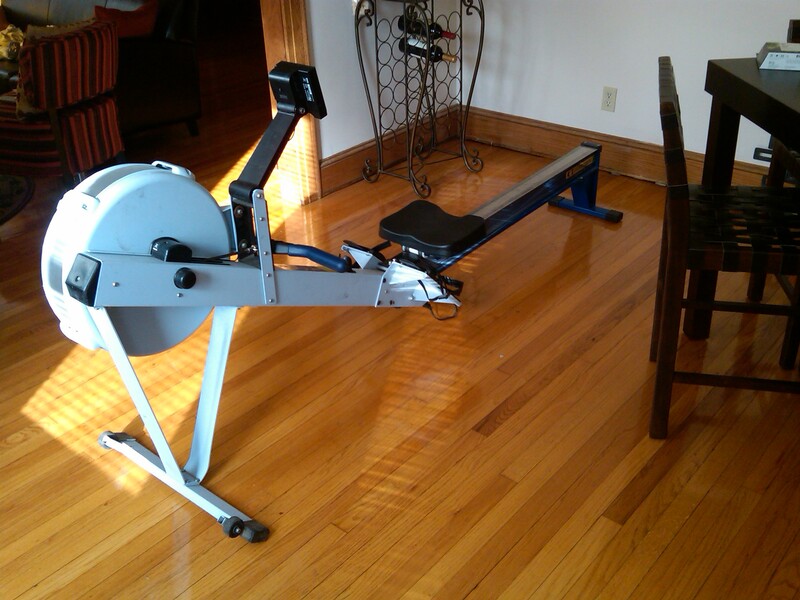 A telltale sign that “I had arrived” and must accept that I am truly a rower is the large Concept2 model D ergometer that I have living in my dining room. Makes for a great conversational piece when guests come over. For those long 75-100 minute pieces, I swing it around to face my flat screen TV and row down a river of Grey’s Anatomy, The Office, and Parenthood episodes thanks to my DVR…I am a Rower: FACT. Last but certainly not least. Rowing takes its toll on the body. Looking at the benefits first, it turns your body into a rock-hard, toned machine. I feel like I could run for miles upon miles on the aerobic base I’m building if only my knees and joints would come along for the ride. I truly feel as though I’m close to being in the best shape of my life…at 26 years old. Okay, that’s not old, but I’m not 18 anymore. As I said. Rowing takes its toll on the body. My hands look like feet. And they look like bad feet. I worked up this lovely blister just this morning. It’s one of my better ones. And rowers truly wear them as badges. You earn your blisters like you earn your stripes. 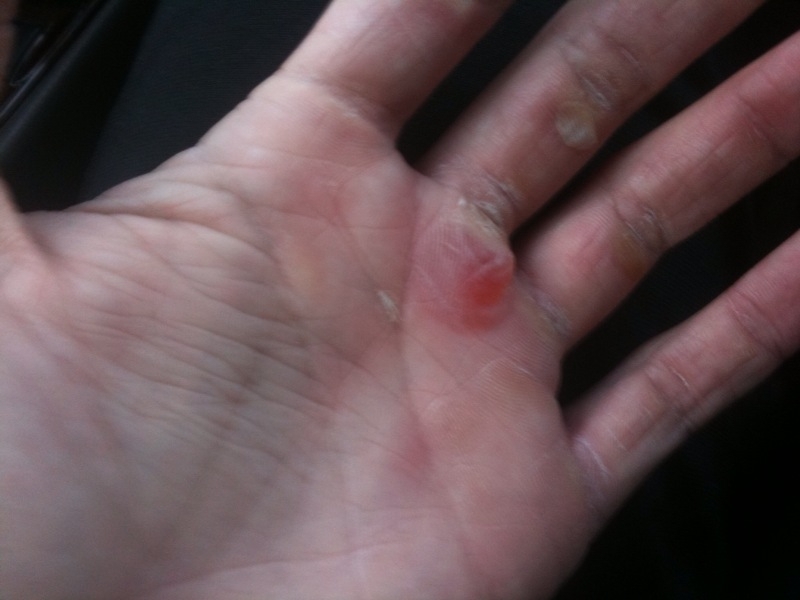 My rowing partner turned my hands over the other day and took a look, “not hard enough, yet.” I couldn’t help but feel disappointed that my hands were not yet calloused like a fine hard leather. My mother would be so proud (note, sarcasm). Gone are the days of soft, lotioned hands….or at least for the next 6 years or so. I am a Rower: FACT. Thanks for the great shout out! We’ll share your awesome blog post with our Concept2 fans & friends. Congrats on joining the ranks of “rower”! You’re already addicted, there’s no turning back… mwha ha ha ha ha! Rowers come from a different stock. Rowers are the sports late bloomers. Do you remember that person who went to the Olympics? Yeah, second team football, good but just didn’t make it. Yeah, always working hard. Rowers were the almost as fast 800 meter runner, two big and bulky but again work hard. Then this mutant of cross sports gets invited to the shellhouse. Sits in the funny lookin’ canoe. Spends time with these other strange people, who don’t look or sound like other athletes. But this place, this place feels like home! And then, the devine moment. That first big race. Not a little scrap along the waterway, but a big regatta race. This is the Religious Experience that separates landbase athletes from an OARSMAN or OARSWOMAN. This is the moment that either you will be forever a rower. The sounds, the smell, the poetry of THE RACE! Everything culminates as that other athlete and it all comes together as that cross training beast. The pieces of the puzzle all come together, the stars are in alignment. You were always meant to be a rower. It just took awhile to put the parts together. I think this is why so many great rowing people develop later in comparison to all other sports. Physical maturity and a less defined characteristic makes great rowing people. Good sprinter, good middle distance runner, not a huge weightlifting machine, and tall lanky. Weird distorted physique. But one undeniable thing about rowers. They make the best neighbors. They’ve always had to learn to be successful. I guess its a result we never see where we are racing to. We rely on our neighbor, our cox to get us there. What other sport long after your high school, college, or club days you can jump back into a shell and those same feelings return in a flood of emotion rowing as a Master. Rowing you gotta love it.